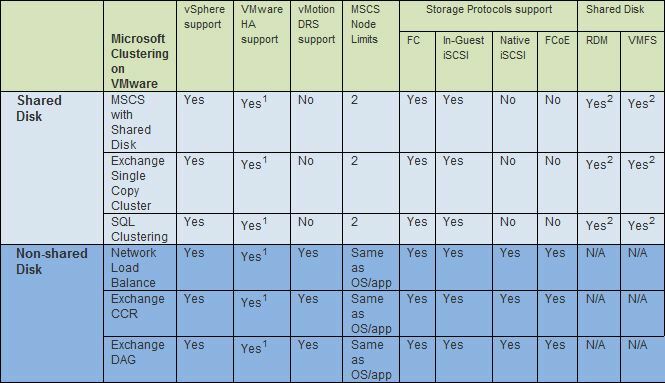 Last year an (online) discussion took place between VMWare and Microsoft on the supportability of Exchange 2010 Database Availability Groups in combination with VMWare’s High Availability options. Start of this discussion were the Exchange 2010 on VMWare Best Practices Guide and Availability and Recovery Options documents published by VMWare. In the Options document, VMWare used VMware HA with DAG as an example and contains a small note on the support issue. In the Best Practices Guide, you have to turn to page 64 to read in a side note, “VMware does not currently support VMware VMotion or VMware DRS for Microsoft Cluster nodes; however, a cold migration is possible after the guest OS is shut down properly.” Much confusion rose; was Exchange 2010 DAG supported in combination with those VMWare options or not? In a reaction, Microsoft clarified their support stance on the situation by this post on the Exchange Team blog. This post reads, “Microsoft does not support combining Exchange high availability (DAGs) with hypervisor-based clustering, high availability, or migration solutions that will move or automatically failover mailbox servers that are members of a DAG between clustered root servers.” This meant you were on your own when you performed fail/switch-overs in an Exchange 2010 DAG in combination with VMWare VMotion or DRS. You might think VMWare would be more careful when publing these kinds of support statements. Well, to my surprise VMWare published a support article 1037959 this week on “Microsoft Clustering on VMware vSphere: Guidelines for Supported Configurations”. The support table states a “Yes” (i.e. is supported) for Exchange 2010 DAG in combination with VMWare HA and DRS. No word on the restrictions which apply to those combination, despite the reference to the Best Practices Guide. Only a footnote for HA, which refers to the ability to group guests together on a VMWare host. I wonder how many people just look at that table, skip those guides (or overlook the small notes on the support issue) and think they will run a supported configuration. This entry was posted in Exchange 2010, VMWare and tagged DAG, Exchange, Virtualization by Michel de Rooij. Bookmark the permalink. VMware might support a client in this configuration, but Microsoft probably won’t. I wonder how many support calls they’ve received on this sort of situation? Since Exchange 2010 SP1, this is indeed supported. Since Exchange 2010 is out of mainstream support, it depends (this is an article of 4 years ago). VMotion’ing Ex2010SP1+ DAG members seems to be supported, but it doesn’t say anything if that applies to cold or running members. Be advised that there are reports of issues after VMotion’ing DAG members, so regardless I’d prefer VMotion’ing cold DAG members.